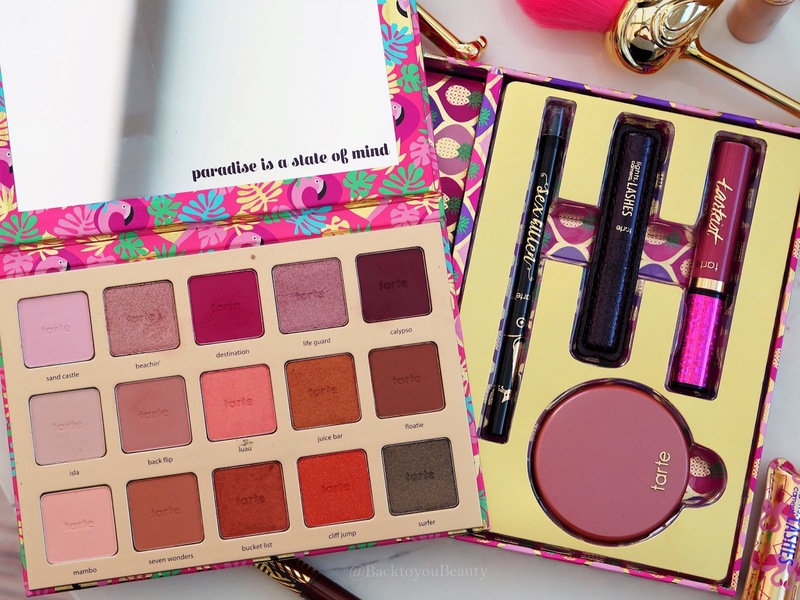 The Tarte Cosmetics Holiday Collections you will want to keep for yourself! Admit it, how many of you are guilty of buying a Christmas gift with the intentions of giving them away….only to keep it for yourself? I know, I know, it’s so hard, especially with the fab Christmas Gift Collections starting to come out. If you are weak in Willpower then maybe turn away now as this years offerings from Tarte will have you converting these for yourself. 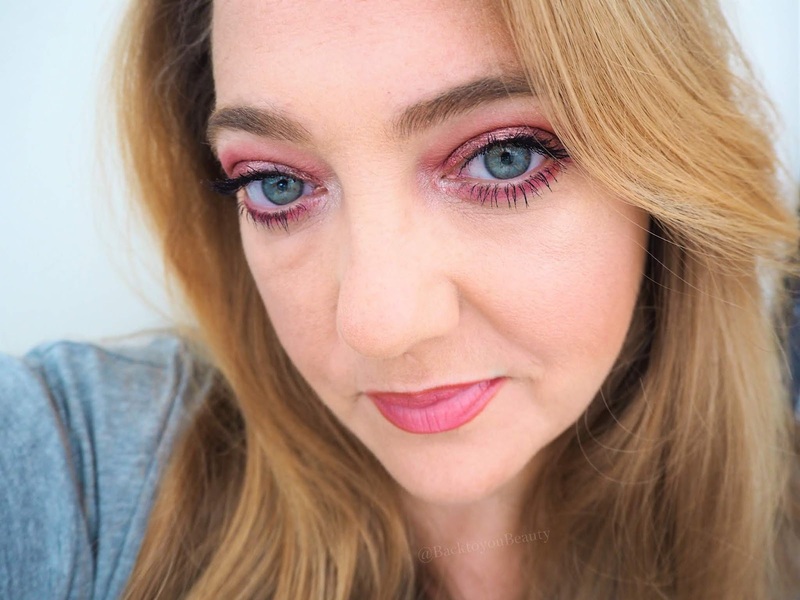 Having long been a fan of Tarte Cosmetics I do find it hard to say no to some of their products and whether you are a fan of their more, “Gimmicky” packaging …whether that be Mermaid, Fairies, Pineapples or Flamingos, there is no denying that their skin loving cosmetics are always beautiful. Below is a selection of Christmas goodies currently available right now. Make sure you let me know which ones tickle your pickle…. I know that many people of my age may not be into the packaging design with the pineapples and flamingos but it really is very cute and does not detract from what is a wonderfully curated collection containing everything you need bar foundation for a full face. The shadows are super creamy, thanks to that Amazonian Clay blend, last a long time on the eye lids and blends like a dream. 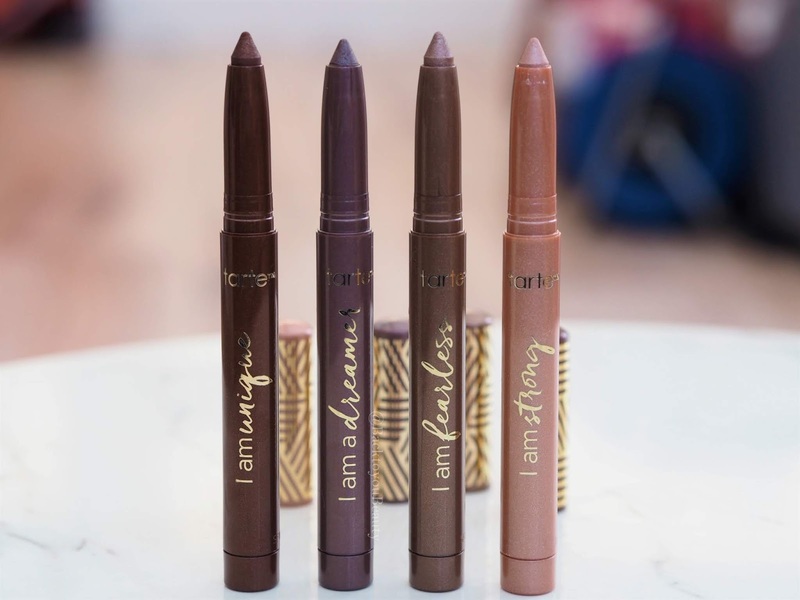 There are mattes and shimmers in an array of colours that will suit all skin tones and types and certainly take you from work to party mode in a flash. I absolutely adore this collection, the blush is a beautiful blend of a light bronze shade mixed with a warm peach and is so flattering, the lip gloss is a beautiful non sticky, very opaque, hydrating mauve colour that does have a hint of a minty tingle and the whole collection is the most outstanding value. Perfect for teenage daughters, to mothers, sisters aunts, best friends and everyone in between. 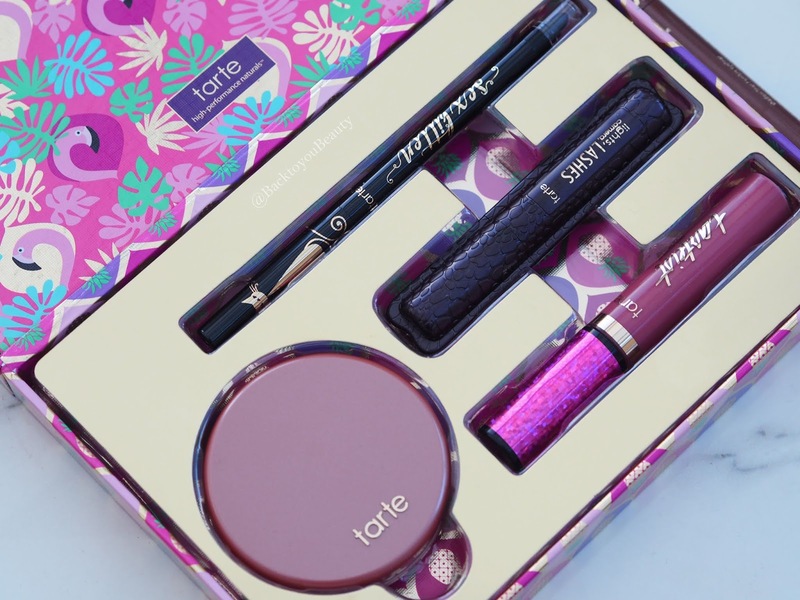 Possibly one of my favourite “Kits” Tarte have created. Wearing this full collection above and below. Now this….this is a Christmas gift to end all Christmas gifts!! If you have a really girlie girl in your household, then you will most certainly win brownie points for this gift. I absolutely love this!! If you bought and loved that beautiful blush palette from last years Limited Edition Blush Collection HERE, then have no fear, the shades are all completely different. 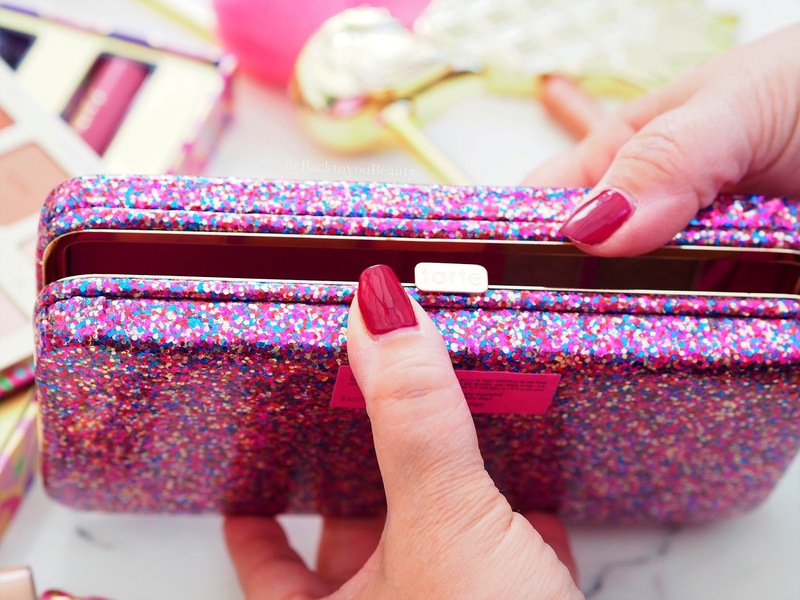 Housed in a very sparkly, pretty, pink, glitter encrusted clutch, are five beautiful face shades. You have three pretty blush shades that are very buildable and can be applied as a flush of colour or as a more punch of colour if you have a darker skin tone, a fabulous warm toned almost bronze (it looks better than it sounds ) highlighter that is stunning, and a beautiful bronzer. If you want shades that last, then try these, they are not chalky or powdery but offer a beautiful glow and almost etherial look to the skin. Sadly they did not swatch very well but believe me they apply beautifully to the skin The blush palette is on a removable tray that comes out leaving a very cute clutch that has a mirror, space for your cards and is deep enough to contain your phone, lipstick and keys. The packaging perfectly matches the Love Trust and Fairy dust Palette. A very pretty gift that can be used time and time again. 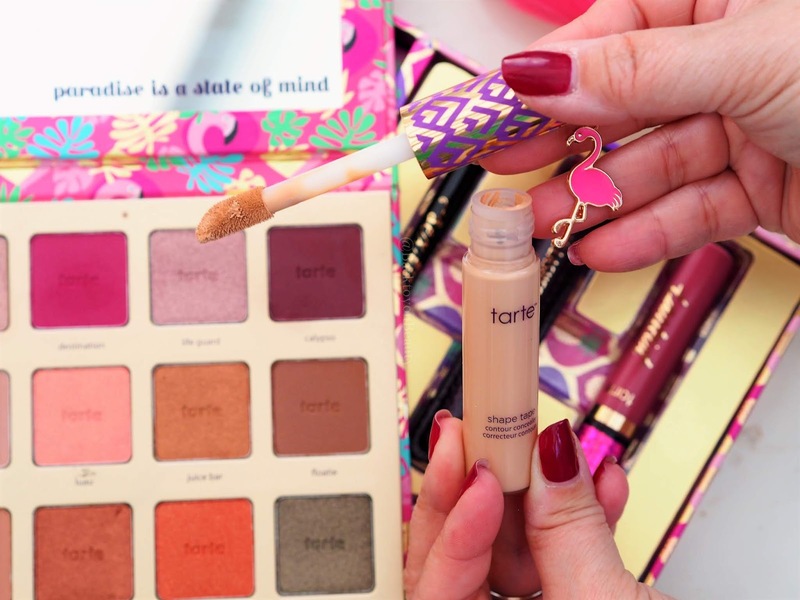 Very Clever Tarte. 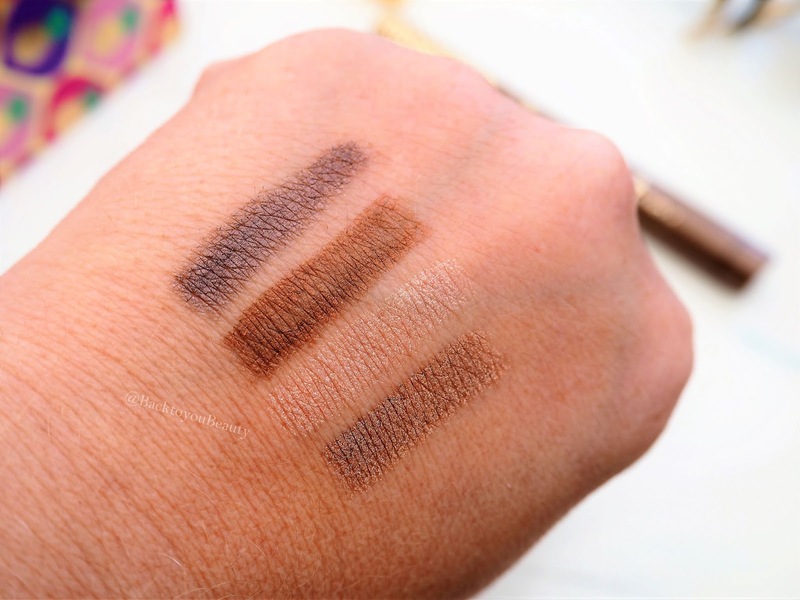 These waterproof and sweatproof shadow liners are perfect for someone that wants quick make up in a flash. Full of great, cruelty free, nourishing and hydrating ingredients, they do not drag or tug the delicate eye area, but apply incredibly softly and smoothly laying down a wonderful pigment that lasts all day. Perfect for shadow and liner, this collection contains four wearable colours. Use one or more to create your perfect colour and combination. Once it dries, it is set and good to go for the day. A great addition to your make up kit or a perfect set to start someone on their make up journey. Loving the inspirational quote down the side too. Tarte are just as famous for this mascara as they are for creating the limited edition “Jacket” that it comes in. 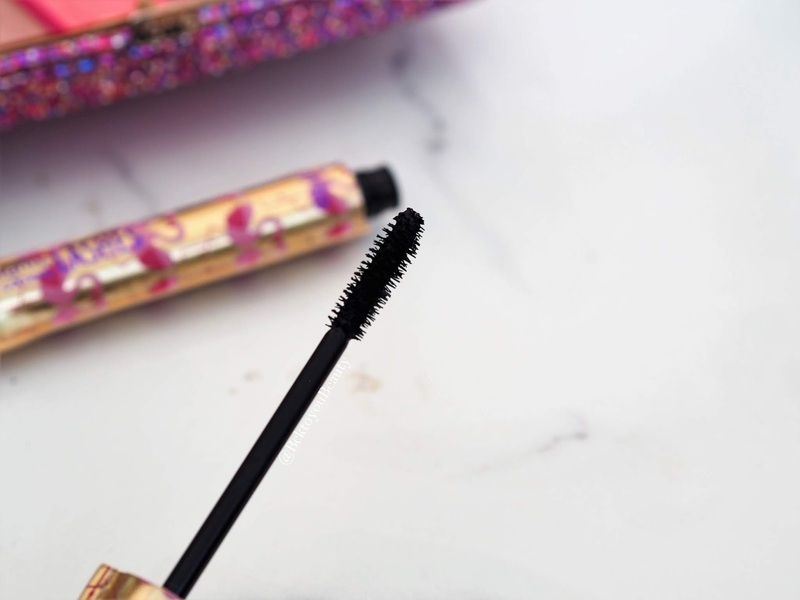 As you may know, this has always been one of my favourite mascaras, and I am enjoying this years Tarte Holiday in Paradise Christmas Flamingo packaging. I am always fully stocked ( don’t forget you must change your opened mascara every three months) with this fabulous mascara. 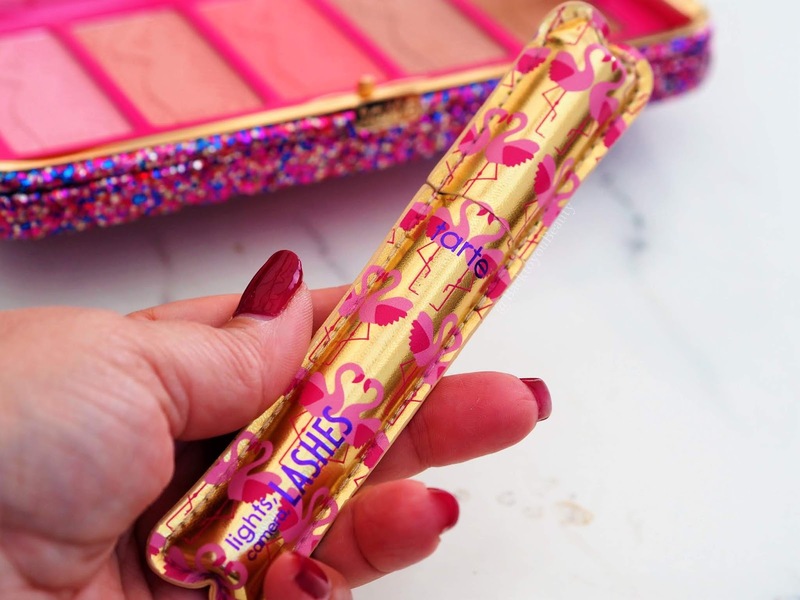 I know there is a tarte army that adore the Lights Camera lashes 4-in-1 mascara as I always receive great feedback when I write about it on my Blog. This velvety, Amazonian clay mascara, is the blackest of blacks and thickens and lengthens eyelashes amazingly! Claiming to instantly increase lash volume by 330% all I know is that when I apply it, my lashes get that false lash look which I love. Infused with a range of plant botanical’s and waxes, this mascara is amazing at lengthening, adding volume and curling the lashes. The rice bran inclusion plumps up and coats your lashes without making them look thick or feel heavy. 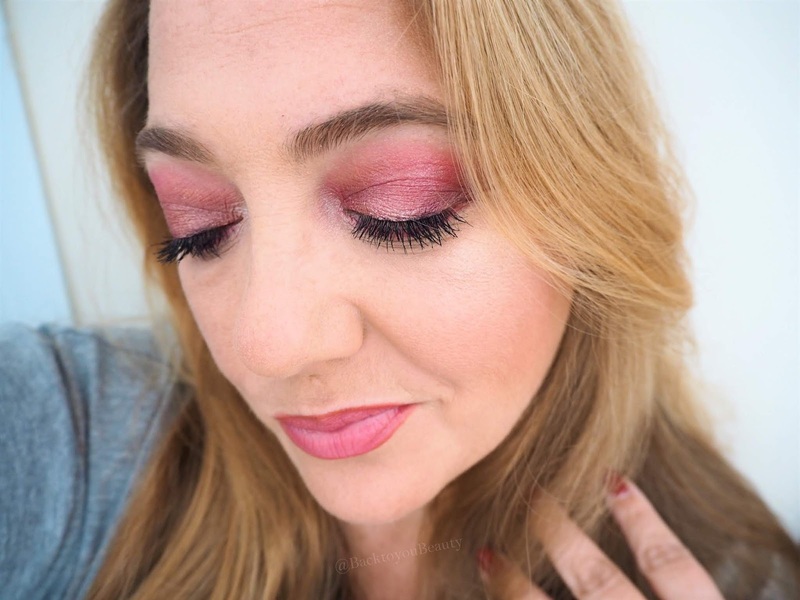 Easy to apply, I start right at the base of my lash and give a little wiggle with my brush as I pull it through the lashes, it doesn’t clump and gives a lovely even coat. This mascara does not budge until I take it off with cleanser. Most definitely a big hit with me. Makes the perfect stocking filler or secret Santa gift. You get two in this collection. The iconic Shape Tape has had a limited Edition make over for Christmas. Included in this little gift set is a full sized Shape Tape Concealer with a Flamingo charm, and the most perfect, mini blending sponge, that has the perfect angles to really get into the areas of the face where you will apply your Shape Tape. I have previously written a very popular post on Shape Tape and you can read all about it HERE. An absolute must have in my opinion. 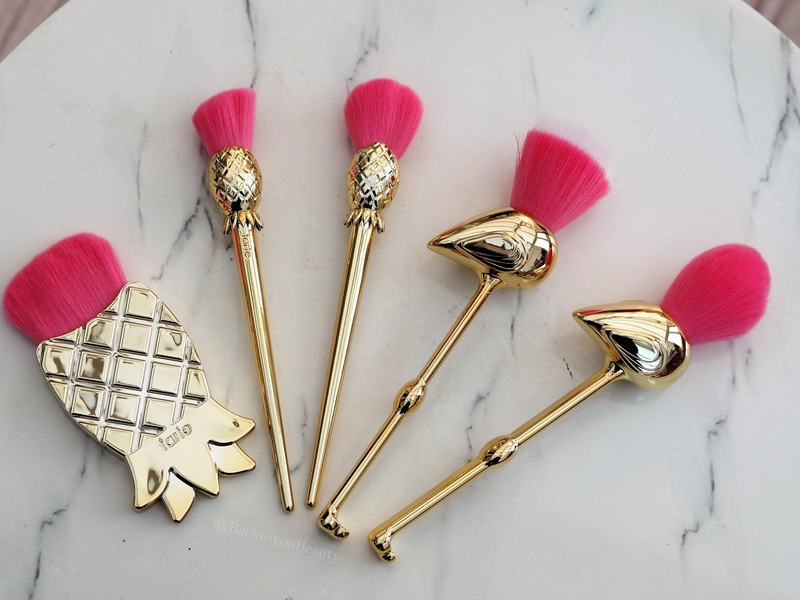 O.K, we know that Tarte love to create Limited Edition brush sets, most of which I can get on board with and they do some of the best cruelty free brushes out there….But! These are a little out there even for me. I would say these are most definitely one for the collectors. 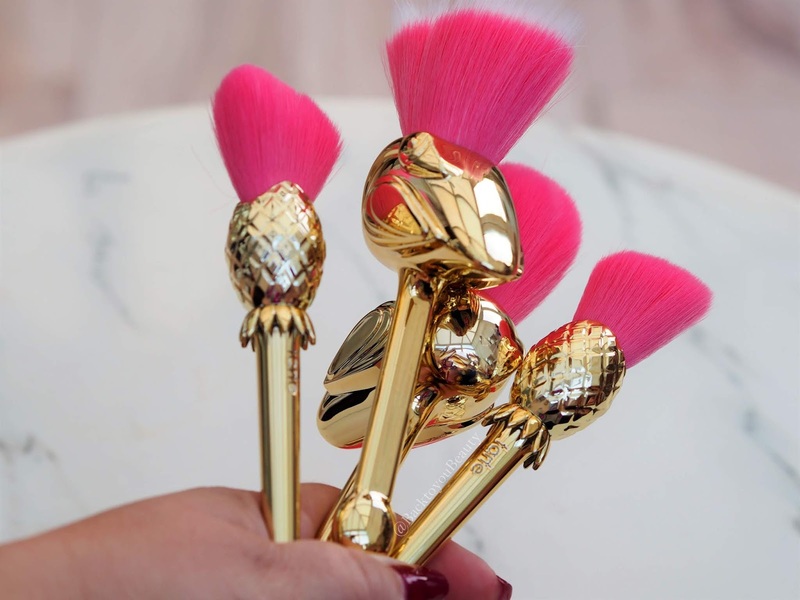 Yes the brushes are soft, yes they are perfect for powders and liquid and yes they feel gorgeous on the skin, but they are big and clumpy. A mixture of Flamingo’s and Pineapples, these are most definitely made to make you smile and make a statement. They would make a great centre piece on your make up table, but I wouldn’t use them personally due to them being quite cumbersome. Every year I really look forward to the Tarte “Holiday” Collections. They are always great fun and incredible value for money. 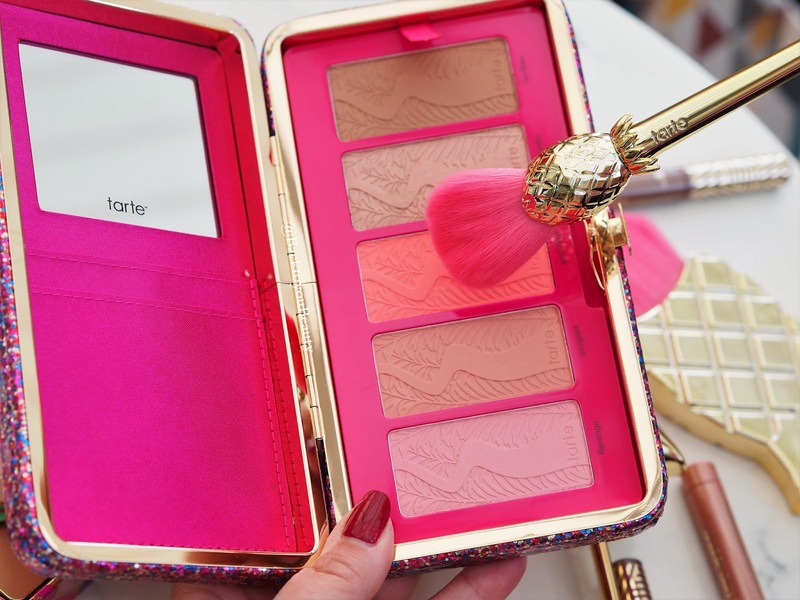 Tarte is exclusive to QVC here in the UK and I always try and bring you the newest launches from them. All of these products are fun and festive and contain such beautiful make up. I am certainly giving some as gifts and treating myself too. What do you think of this years collection? Will you be purchasing any? I would love to hear from you, please leave me a comment below. "Elemis Pro-Collagen Day to Night Skincare Gift – 6 piece collection QVC TSV"
There is no way I'd give this away!! This would be a gift from me to me lol absolutely stunning! !